In Orthodox Christianity there are many traditions. One of such processions are performed on special festive days. The practice of processions has a very ancient history. Since the establishment of Christianity as the main religion of the Roman Empire (IV century) religious processions firmly in the Church's liturgical life. The procession is the procession of believers with icons, processional crucifixes and banners through the streets of the village. 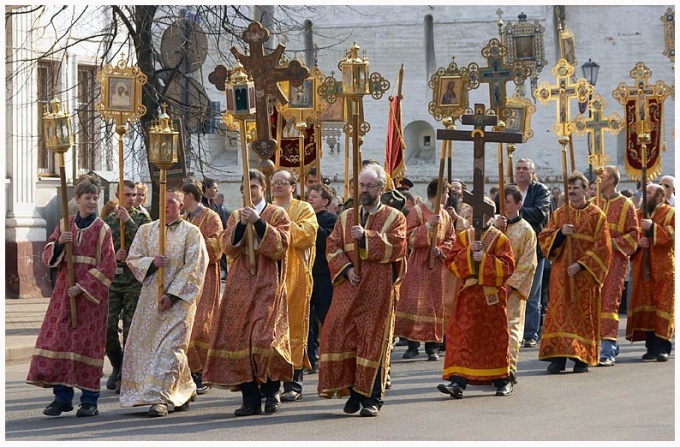 Processions are a visible symbol of the testimony of the Orthodox faith to the people. Such processions can be carried out not only on the streets of a city or village, but just around the temple. At the same time, the clergy and the choir sing certain prayers, read passages from the Holy Scriptures. For bogosluzhebnye the Statute of the Orthodox Church processions are carried out during the feast temple festivals. Also the procession can be carried out and other memorable Church dates. The Commission of the procession may be determined by the Abbot of a particular temple. Processions can take place in the days when the city comes on different shrines. For example, the miraculous icon of the Mother of God. In this case, the clergy and the people can March with miracle-working icon from one Church city to another. Processions processions can also be performed on sacred springs. When believers come to the Holy spring, is vodosvyatny prayer. The main component of the procession is the prayer of believers. Every participant in the procession have myself to pray about their needs and the needs of their neighbors. In addition, during religious processions are praying for the entire population of the town of Lee village.